yesterday morning i started unpacking following my summer holiday in Canada and Malaysia. Kim got me a pair of Crocs which i had packed in a plastic bag. i took the bag out of the suitcase and put it on the floor. 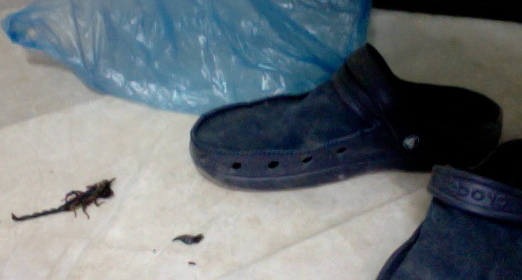 This morning i took the pair of Crocs out of the bag and proceeded to put them on. First right then left, hey what’s that? There was something, felt like a bunched up plastic bag in the shoe. After two attempts i took off the Croc and shook out a still very much alive scorpion! It’s life ended soon after that (i’m not a Buddhist). i hadn’t seen a live scorpion since we’d lived in Temburong, Brunei 15 years ago and found them crawling about our house fairly frequently. i was reminded of my first CUSO orientation back in January 1979 when we were told it was a good idea to shake out shoes before putting them on as a regular practice. i also recalled when one of my teacher trainee students in Nigeria was stung by a scorpion while i was on duty; i had to take him to the hospital and he never stopped moaning and gnashing his teeth in utter pain and misery. i knew that i was supposed to shake out my shoes but i didn’t, i was lucky this time. Next time? i’ll just have to remember to shake out my shoes. Now i’m wondering if this scorpion came with me from Malaysia or if it was an Omani scorpion. He didn’t have any travel documents so i guess i’ll never know. « God Save the Queen!